Cucurbita pepo Light green, ridged courgette, that is also one of the best squashes for drying (slices of green fruit harvested in summer at the large courgette stage)This Italian heirloom came to us via carol Deppe. Sow in April under cover and plant out in May or June. 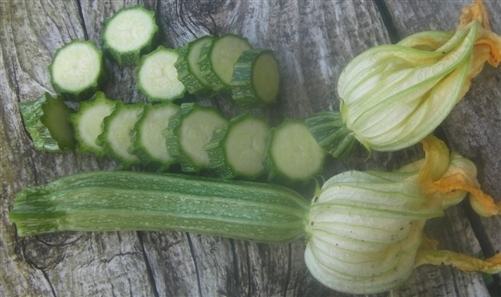 Harvest when small as a courgette and fist sized for drying. This is an Open Source Seed Initiative Pledged variety. You are buying full rights to this seed rather than just renting it for a season. You have the right to use this seed however you want, breed with it, or even grow and sell the seed yourself. When you buy or accept this variety, however, you are agreeing to honor the OSSI Pledge. Open Source Seed Initiative Pledge: You have the freedom to use these OSSI-Pledged seeds in any way you choose. In return, you pledge not to restrict others’ use of these seeds or their derivatives by patents, licenses or other means, and to include this pledge with any transfer of these seeds or their derivatives. For information on how to join the Open Source Seed Initiative movement as an individual member, a plant breeder, or a Partner Seed Company, and for a list of OSSI-Pledged varieties and OSSI Partner Seed Companies, visit http://osseeds.org/. Join in the fight to protect and expand the rights of gardeners and farmers everywhere to save, breed, swap, and sell seeds!